Willie Mullins took the G1 Betway Bowl for the first time since Florida Pearl scored for him in the £200,000 contest in 2002 with Kemboy, ridden by Ruby Walsh. The syndicate-owned seven-year-old unseated his jockey at the first fence in the Cheltenham Gold Cup last month, but gained plenty of compensation here. The 9/4 favourite beat Clan Des Obeaux by nine lengths in an impressive performance. Mullins said: " He never put a foot wrong from what I could see, but they are awful conditions. I was worried when we have had a race on the chase track already that it would have opened the ground and might not have suited Kemboy, but it looked like he had no problems seeking out that trip and further. "You have days of good luck and bad luck. We had bad luck at Cheltenham and things worked our way today. "We haven't been too hard on him this year - that was only his second run really since Christmas - and he will go to Punchestown. I thought the Savills Chase [which he won at Leopardstown in December] was going to be his big day, and he was just unlucky at Cheltenham. 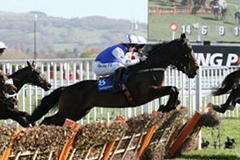 "I think that he is a horse who could go on further than Punchestown. I would like to travel him abroad - I think he goes on good ground - and I would like to maybe take him to America later in the season. We will see." Walsh, who rides Rathvinden in Saturday's £1-million Randox Health Grand National - like Kemboy, that horse is trained by Willie Mullins - said: "It felt really smooth - he was in a great rhythm and eyeing the fences up in his own stride. We didn't go a great gallop, but the ground is getting slow and he just jumped and travelled and it was always comfortable. I didn't do very much, I just sat there and let him do it. "He appeared to have a great chance in the [Magners] Cheltenham Gold Cup [unseated at the first] on form, but it didn't happen. That's just racing for you. He bounced out of that race in good form and Willie decided to bring him here. It's great for the owners [Supreme Racing/Brett Graham/Ken Sharp] who are a huge syndicate and get a great enjoyment out of it. It's big days like this you are in it for, and, while it's a pity the sun isn't shining, they won't mind the rain. "It's lovely jumping weather. I love riding horses on slower ground - it's so enjoyable. I was in my element out there - I'd call it yielding. Kemboy once won a slow-ground hurdle at Limerick and Cadmium, who won the other division, runs in tomorrow's Topham Chase. They have been two very lucky horses for their owners." The Betway Bowl was first run in 1984, originally designed as a consolation prize for horses which were beaten or had been unable to participate in the previous month's Cheltenham Gold Cup. The inaugural running was backed by Perrier-Jouët, and it was titled the Perrier-Jouët Champagne Cup. For the following three years it was sponsored by Whitbread and called the Whitbread Gold Label Cup. Totesport began supporting the event as the Totesport Bowl in 2008 and the sponsorship was taken over by Betfred in 2012 after that company purchased The Tote in 2011. Betway took over sponsorship from the 2017 running.